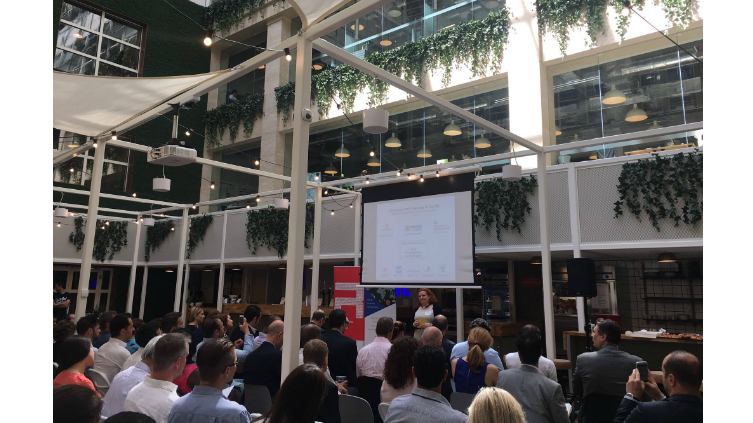 We teamed up with our friends at JMB Partnership and Department for International Trade (DIT) for the third time to host a practical panel session on how to successfully launch and grow a tech business in the UK. Intended to provide tech businesses from all sectors and countries of origin with a rare opportunity to learn from their peers, we put together a stellar line up of panellists from international tech businesses at varying stages of their UK market entry journey. A 100 strong crowd assembled at WeWork’s atrium in Holborn from destinations as diverse as Israel, Istanbul and Indonesia. Following an introduction by DIT’s Terry Mankertz, Joanna kicked off proceedings by focussing on why ‘you need to treble everything when it comes to launching in London’ – time and budget, but also fun – and the ‘what, why, how, where and who’ of market entry from a communications and brand building perspective. James Blakemore from JMB imparted the importance of securing early sales leads and Katie Lewis of The Accelerator Network raised a laugh with her tip about ‘finding your 20 bald men’ when you launch in a new territory (meaning canvas a depth and breadth of opinion before you take too many decisions). DIT’s Technology Specialist, Chris Moore then took up the moderator seat. In addition to Katie, the panellists were: Salim Ziade from Dubai, Co-Founder of EasyCat, the world’s first catalogue sharing network, Helen Wang, CEO and board member of Chinese fintech company BBD, American Farhan Lalji, Partner at Rokk3r Lab, and Jonathan Partouche, President and Founder of French owned cyber protection company Origone which set up in the UK in March 2016. Figuring out how to ‘pin down a Brit’ – someone being polite about your new product or service doesn’t necessarily mean they will buy it! If you can succeed in London you can succeed anywhere!